Somebody once told me that every single councillor is there because they believe they can do good. I honestly believe that. I, however, do not expect every councillor to immediately have the knowledge to be able to engage with the council officers in a constructive manor. So when it comes to public realm schemes, councillors “trust” the officers to get it right, or even trust other councillors with more expertise in that area to help them get it right. So a project is delivered, campaign groups and residents watch and then begin to give feedback through letters/email/talking/shouting. The councillors then go back to the officers and “get it fixed”. This is how Cycle Bath had some of the posts moved on the Widcombe scheme. It was nonsensical to put the lamp post in the middle of the path and not on the edge out of the way. It’s a very re-active approach, costly and time consuming. You wait for it to be built, then raise a concern. A better pro-active approach that tries to get the design right at the beginning of the process is needed. The following two spreadsheets can be used to provide a more pro-active approach at the scheme design phase. This should not only save the council an absolute fortune, it should free up a lot of time and effort on the behalf of everyone. The tools are taken from the appendices of the Welsh Active Travel Design Guidance. They take about 10 minutes to fill out. It will also enable councillors to evaluate current public realm space and push for changes. Roads being resurfaced? Do an audit and see if changes can be introduced. These are also available on our resources page for future reference. As an side the Welsh guidance has a fantastic set of appendices describing pretty much every type of road design you may want to consider in any scheme. It’s a living document so will get better over time. 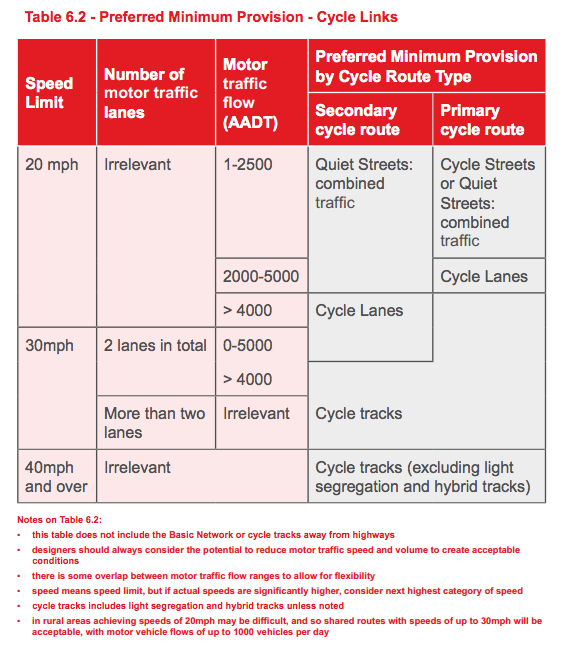 It borrows much from the Dutch CROW manual, Transport For London Guidance and Sustrans design guidance. It’s pedigree is pretty damn good, but of course not perfect.